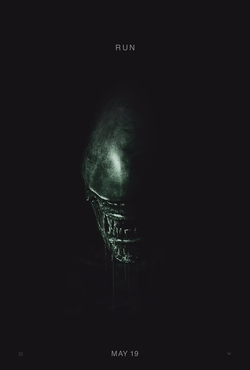 Alien: Covenant is a forthcoming British-American science-fiction horror film directed by Ridley Scott and written by Jack Paglen, Michael Green, and John Logan. It is the sequel to the 2012 film Prometheus, the second installment in the Alien prequel series, the sixth installment overall in the Alien film series, and the third installment to be directed by Scott. The film stars Michael Fassbender, Noomi Rapace, and Guy Pearce, returning in their roles from Prometheus, with newcomers Katherine Waterston, Billy Crudup, Danny McBride, Demián Bichir and James Franco. The film is scheduled to be released on May 19, 2017. Plot– Bound for a remote planet on the far side of the galaxy, the crew of the colony ship Covenant find what they believe to be an uncharted paradise. What the crew discover is a dark, dangerous world, whose sole inhabitant is the “synthetic” David, survivor of the doomed Prometheus expedition.